Imagine how three-dimensional printing, driverless cars and artificial intelligence will change our future. Or think of how developments in information technology, e-commerce and the sharing economy are already changing the way we learn, work, shop, and travel. Innovation drives progress and, in economic terms, determines productivity growth. 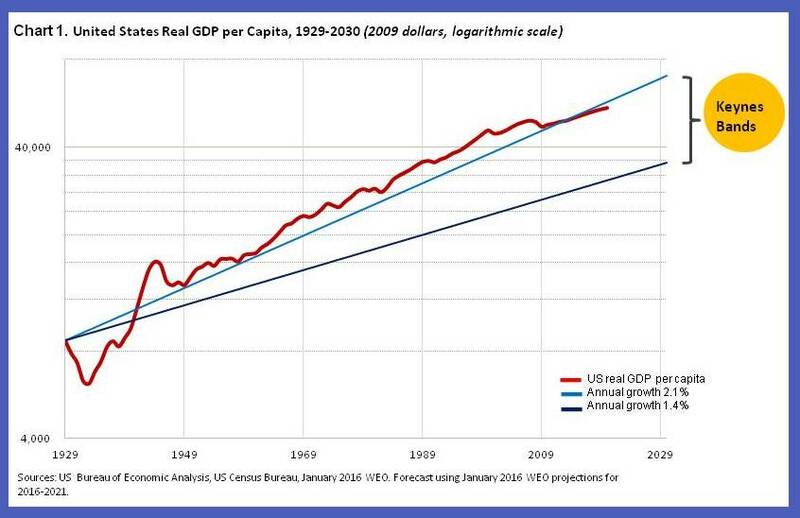 And productivity growth, in turn, determines prosperity. It impacts our lives and well-being in fundamental ways: it determines where and how long we live; it determines our quality of life. In the spring 2016 Fiscal Monitor, we look at innovation as shaped by effort and incentives. That makes innovation highly dependent on government policies. We find that a little government support can go a long way in boosting innovation and growth. For example, we document that public policies that would reduce the cost of private R&D by 40 percent will lead to increases in private sector effort by the same percentage, and increase GDP by 5 percent over the long run. If we simplify the prediction and take progressive countries to mean the United States (the country that defined the technological frontier during the relevant decades) we can picture Keynes’s prediction as in Chart 1. The chart shows in log scale the upper and the low-end of the range indicated by Keynes. Perhaps ironically the initial performance was not inspiring. But, since the early 1950s, the U.S. economy has actually performed above the upper end of Keynes’s bands. We interpret this story as indicating that, while the details of innovation are fundamentally unpredictable, innovation is determined by human incentives and can be anticipated in broad outline. Research and development (R&D) is a key driver of innovation. Governments play a critical role in funding higher education and basic research, the basis upon which firms can build their own R&D. 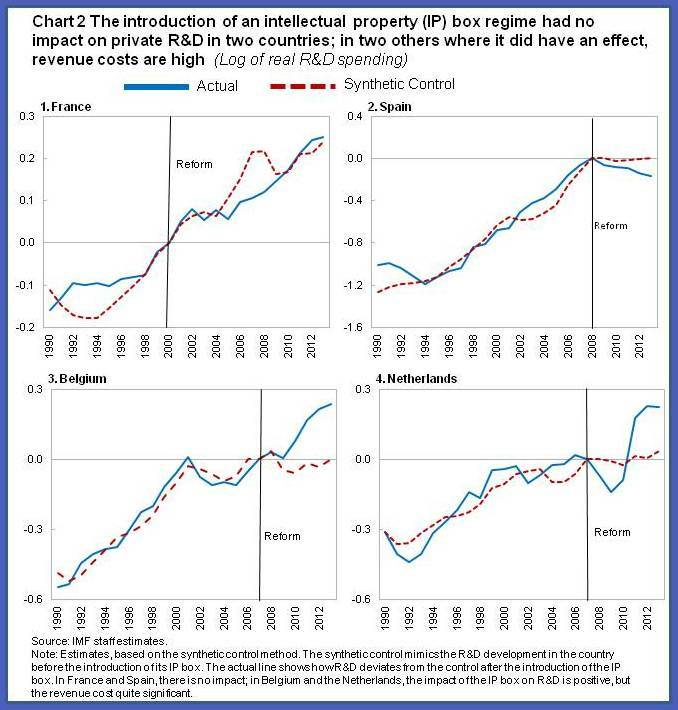 But fiscal policies are also important to foster private R&D investment. Private firms by themselves don’t invest enough in R&D for two reasons. First, they often find it difficult to finance risky R&D investment projects, even if the projects are expected to yield high returns. This is especially so during recessions when liquidity constraints are more prevalent. Our new analysis finds that fiscal policies that help stabilize output do significantly raise private R&D investments and support productivity growth. Second, R&D investments by firms benefit the wider economy. For example, researchers in technological hot spots such as California’s Silicon Valley exchange knowledge and ideas; technologies embodied in new products or equipment can be imitated by others or can inspire follow-on innovations. But a single firm will not take these spillovers into account when deciding how much to invest in R&D. We find that fiscal incentives should reduce the firm’s cost of investing in R&D by 50 percent on average in advanced economies, to encourage firms to do more R&D. This would efficiently reap the benefits for the wider economy. Such fiscal incentive would increase R&D by approximately 40 percent compared with current levels and lift GDP in advanced economies by 5 percent in the long term. International spillovers add to these domestic R&D spillovers. Adopting foreign technologies is a key component for catching-up growth that is critical for emerging markets and developing economies. Estimates suggest that R&D undertaken in the G7 countries yield productivity gains in other economies of about 25 percent of the G7’s own return. Taking that into account, global R&D should rise by 50 percent and global GDP could increase by about 8 percent in the long term. While fiscal incentives can be a powerful tool to encourage private R&D, their design and implementation is critical. Fiscal incentives to encourage R&D vary widely. Australia and Korea, for instance, grant R&D tax credits that effectively reduce the costs of extra R&D investment by nearly 50 percent. Other countries sometimes grant labor-cost relief for researchers or provide targeted R&D subsidies, although in most countries at rates of less than 50 percent. Overall, these policies seem to have worked well, provided that their implementation was effective. Not all fiscal incentive policies are well designed. Several countries have recently introduced so-called patent box regimes, which reduce corporate tax burdens on income from patents. Our results indicate that, in some countries, these regimes have had no discernible impact on R&D at all (see Chart 2). In countries where they did have an impact, the fiscal costs are quite significant. Governments could have used these lost revenues better to provide direct incentives for R&D. And in many cases, patent boxes are simply part of an aggressive tax competition strategy, creating negative impact on the tax base of other countries. Many radical innovations result from small entrepreneurial ventures engaging in experimentation. Innovation therefore depends critically on an efficient process of entrepreneurial entry, growth and exit. However, in many countries this process is hampered by obstacles, such as permits and licenses, labor-market regulations, financial constraints and tax barriers. 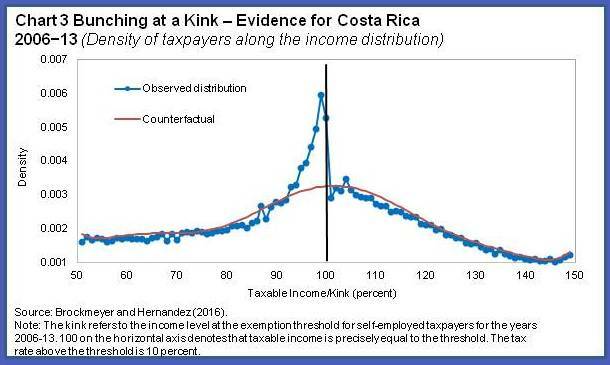 In the Fiscal Monitor, we explore the importance of tax distortions and find evidence of some adverse effects of high corporate income taxes on entrepreneurship. Governments in some countries try to neutralize these tax distortions by offering special tax incentives for small companies. However, these incentives are not cost effective and can even discourage firms from growing due to a so-called small-business trap. For example, lower taxes for small firms lead to “bunching”, an accumulation of small firms all trying to remain just below the income level at which the preferential treatment is phased out (see Chart 3). This constrains rather than supports productivity growth. Instead of providing incentives to small firms, governments should target fiscal support to new firms. Countries such as Chile and France have developed effective policy initiatives to support young innovative start-ups. In addition, to minimize tax distortions to the entrepreneurial process, governments can provide generous provisions to offset taxable losses and simplify tax rules to reduce the compliance burden for firms. Innovation and change are the key drivers of long run standards of living and prosperity. R&D, a key driver of innovation, responds to economic incentives and public policies. IMF research shows that a little well-designed public support can go a long way. For example, we show that fiscal support to R&D, justified by domestic spillovers, and costing 0.4 percent of GDP can deliver 5 percent higher GDP in the long run. If international considerations are taken into account the cost would increase to 0.5 percent of GDP, but the benefits would increase proportionally even more, to 8 percent. Smart fiscal policies matter. They matter a lot. Public and private sectors can work together in complementary ways to boost innovation and growth. Can you imagine Keynes and Schumpeter smiling together?